Our Affiliates Program is a great way for anyone to earn money promoting their short stories and books written by Writing for the Soul Workshop™. We provide five-star support every step of the way. Ages 13 & up! Minors must get permission to participate. How do I do it, and how much can I earn? Step 1. Scroll down to submit a story using the Contact Form below. You’ve got amazing writing inside of you. Uncover it! Discover it! You have permission to explore, fail and soar to writing abilities you never thought you had! Don’t worry about mistakes! Step 3. Complete the Affiliates Agreement that we will email to you to receive your Sales Training Manual. 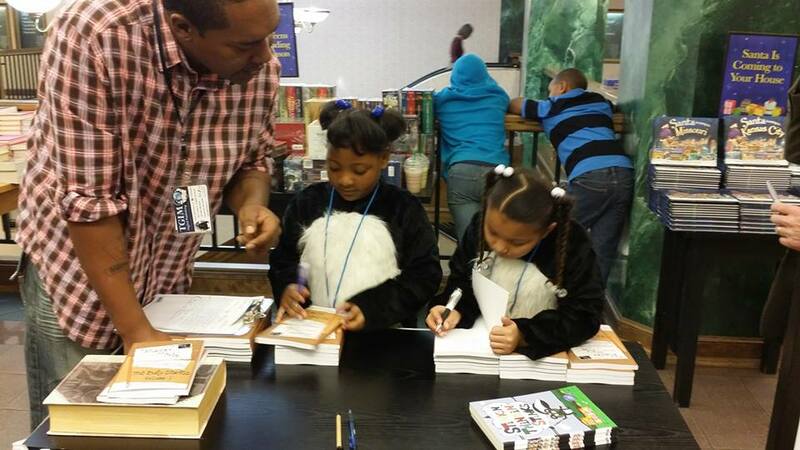 D’Vyne(center) autographs copies of The Bully Diaries at Barnes & Noble on the Plaza in Kansas City. I did the right thing by telling. I thought she would bully us the next day, but she didn’t. Now I know that telling on a bully is the right thing to do. Click here to see D’Vyne’s story and what yours will look like. Once your story is submitted, you will receive detailed training and customized marketing blurbs, making online sales for you EASY! Want to start earning money? Use the 3 easy steps above to get started today! All ages welcome to participate regardless of ability. Well, what are you waiting for? Use the Contact Form below to get started!